It was a strange feeling ‘coming back from the dead.’ You thought you had buried that part of you, never to see it again. Started working on rebuilding a new life hoping to make it better than the one before. You tried to avoid the same mistakes, made sure to look over your shoulder, to not draw any attention to yourself and were so very careful with everything you did. You tried to plan for everything but, even the best laid plans could fail. They had planned for everything. At least, that’s what they had thought. Maybe the peace had made them drop their guard some. After months of constantly having to wonder if the remaining Triads would find them they finally had time to relax. She and Kenji had been enjoying their time together, building a life together and learning to live without the mask. It had been a long adjustment period but once they got over that hump things had turned out nicely and they had fallen into the safety net that normalcy created. Knowing how the Triads acted Zuka had expected some kind of public ambush or over the top attack. Triads never did anything quietly, if you crossed them then they would let the whole world know. Back in her time she had seen a street side café come under fire just to get to one person. Entire families wiped out because one man refused to pay his protection money…horrible, boisterous things that left a impact on the entire city and made anyone else thinking of doing something just as foolish to stop and have second thoughts. Of course, the attack on them had sent a message only it was not like anything else she had seen before. It was subtle. The thugs that had been sent after them thought it was because she and Kenji owed money to their Triad and were there to collect on that debt. They had no idea who the two of them actually were. Had it been any other time the encounter would have been a nuisance at best but this went far beyond that. While the goons might not have known who the two of them really were whoever had sent the two thugs had known. They knew where to find them and knew just what to do to draw them out. It was subtle, it was bold and it terrified her. She and Kenji had been so careful, had made sure to cover their tracks and erase all trace of themselves from the world and yet somehow someone knew they were alive. After they had been found out they had two choices. They could run; destroy this life and start over again on a different island with new names and hope they buried themselves deep enough that whoever this was didn’t find them again. They could face the problem head on and return to Republic City. The decision was not one made lightly. Returning came with more than its fair share of problems, but, ultimately it was the only choice they had. They could have ran again but whoever had come after them had to have other knowledge too. Zuka feared for Nevas safety, for Teos and for Zulas. All of them were involved in her and Kenjis plan and they all were at risk. She had to assume that if this person could find Kaitio and Umi then they had to know about the others as well. It was a risk she was not willing to take. Zuka never thought she would have a hard time readjusting to life once again in Republic City but coming back she felt more like an outsider than she had ever before. One didn’t just fake their own death and think they came back to everything being the same. That went double for someone that had been involved in organized crime like she had once been. News of her return spread like wild fire and while Zuka did her best to keep a low profile the various informant channels around the city did their job. Soon everyone knew of her resurrection and that came with a flurry of rumors. Zuka had given a official statement on her return to the paper to try to curb those but that didn’t stop any of the damage. When an ex Triad boss disappears in the midst of a destructive gang war and then reappears some time after it looks bad. Many of her former Triad members and fellow bosses thought she had turned and become some kind of informant. Having traded information about Triad dealings in the city for witness protection and given her refusal to once again take up leadership of The Dolls or to deal in any other kind of related business Zuka could understand why people thought that. It was what it was, frankly she didn’t have the energy or the desire to try to come up with some kind of explanation on the contrary. Would it be nice to still have those Triad connections that she had worked so hard to build? Of course, but given the nature of her return and her new line of work it was best to sever those ties. Her return also brought with it yet another problem. Zuka knew her reappearance would draw the attention of her old enemies. True, Han her biggest and most problematic enemy was dead there were others out there that hated her just as much and from what she had gathered they had suffered great losses in the attacks and fire bombings the night she ‘died’. So, she had to be careful and watch her step around the city doubly so as there was no telling who was involved. That didn’t mean she was just going to shut herself off from everything though. While Kenji obsessed over the mystery of just who had smoked them out Zuka returned to the Blue Dragon and spent her time there. Now that she had cut all Triad ties there was a substantial loss of profits that the underground casino had brought in that she had to fix and it was quite the project. Zuka helped Kenji where she could but when she wasn’t doing that she focused her attention on rebuilding her empire. It kept her mind busy and gave her something to do. Sadly, keeping a low profile also meant abstaining from The Talon. Having Zuka and The Talon return at the same time would raise too many eyebrows and since they were no closer to knowing who this mystery person was it was better to avoid drawing anymore unwanted attention on themselves. Of course, that was easier said than done. Zuka had never been a woman of inaction. Her first instinct was to jump right back into things and meet this threat head on but.. she refrained. It didn’t help her restlessness any either knowing that Kenji and Zula were out there and she wasn’t but Kenji had an advantage she didn’t. He had never been very public about his presence in the city like she had been so it was easier for him to slip under the radar. In retrospect, had Zuka known this was how her life would have played out when she first came to Republic City to make a name for herself she would have done so in a much…quieter way but, it was what it was. After a few weeks of working on rebuilding her club and looking for ways to fill the profit gap Zuka came to a solution. Since there was nothing legal she could do to the Dragon to boost profits as of yet she would have to find them elsewhere and one way she could do that would be to open another nightclub. Opening a second club was an ambitious project and given her current reputation it was possible she could fail but, on the other hand given her experience in the business there was also a high chance that it would take off. Having a second location came with a laundry list of other possibilities as well. The most important being that Kenji, Zula and herself could outfit the basement of this second location to their own personal use. Kenji had his stash of safehouses around the city which was all good and well but this could be a base of operations per say, common ground for all of them, Teo and Neva as well. After bringing this plan to the others, getting their thoughts on it and scouting locations Zuka had found a building that suited their needs. Negoations for the purchase had been a bit tough but with a little help from Zula calling in a favor or two to help push the sale through the building was finally hers. The property needed a lot of work, that area having been ravaged in the Equalist attacks a few years back and then again in the explosion the building had seen better days but Zuka was fine with a project. Between this, training and the Dragon she wouldn’t have much time to worry about much else and that was how she wanted it. When she wasn’t at the Dragon, training Zula or helping Kenji Zuka would spend her time at the other property. To save on cost Zuka started doing repairs on her own where she could (who knew fixing their run down shack on Kyoshi island would come in handy) and she would often times stay until the early hours of the morning. Kenji and Zula had both voiced their concerns of her being there alone like she was but Zuka assured them she would be fine. One night after putting in a few hours of work Zuka decided to call it quits a little early. She had been working on repairing a few interior walls when she caught a glimpse of the time. It was only eight and while normally she wouldn’t stop in the middle of a project she had other plans tonight. Zula and Neva had managed to convince Zuka to take a break from her work and spend time with them. Zuka couldn’t remember the last time she had a girls night out and the other two insisted (quite strongly) that they could all use a break. Teo had even somehow convinced Kenji to take a break as well and the two of them had their own plans. If she was being honest Zuka was really looking forward to this. Having spent majority of the few months they had been back locked inside had taken its toll on her and she was excited for any chance to get out and do something. After putting everything away and locking up Zuka stepped out into the warm night air. Summer was always nice in Republic City, it never got too hot thanks to the mountains but it was still pleasant. It was amazing how the city came more alive too. Naturally a city as big and populated as Republic City would be bustling no matter what the temperature was like outside but there was something about the summer months that brought out the best of the city. Stepping out of the building Zuka looked up and down the street. This part of town was slowly being built up after the attacks so naturally not a lot of people ventured this far but she still checked out of habit. When no one seemed to stick out of place and she deemed the coast clear she began walking toward the train station. Teo had her satomobile at his shop for repairs and while it was a slight annoyance she didn’t mind walking and the station wasn’t far (another reason why she liked this location). As Zuka walked she became aware that she wasn’t alone. Slowly, figures started to come out of the shadows of the alley ways and follow behind her. Zuka kept walking, keeping her pace slow so not to tip them off that she was on to them. As she did that she tried to gage just how many were behind her. Without turning to look it was hard to say but she would have to say three, possibly four. Ok, four was doable. She had worse odds than that before. Zuka turned her head slightly to try to get a glimpse behind her and as she did that another figure stepped out of the alley in front of her and blocked her path. Quickly Zuka turned her attention back front and stopped just before she ran into the shadowy figure. As she stopped Zuka looked up…and up and met her eyes with a familiar face. Mei had been her go to muscle when she still ran The Dolls. Mei was as strong as she was large and having worked with her for so long and seeing her work up close Zuka knew that she was in trouble now. Four regular thugs she could take, Mei a different story. She was practically four in and of herself. Now that she had stopped the others had closed in behind her and spread out into a circle, surrounding her. Zuka looked around, recognizing some of the faces from various Triads. A firebender from the Agni Kais, a earthbender from the Triple Threats, Mei from her old group as well as two nonbenders were all gathered together. It was a odd group, not one you would find paling around together and it made Zuka wonder. Had someone managed to unify the Triads? That had been a dream of so many Triad leaders but no one had ever been able to bring them all together for long. Seeing everyone here though made Zuka second guess that but…that was a thought for later, there were more pressing matters to deal with right now. Zuka’s eyes scanned the faces around her before coming back to settle on Mei, the large woman’s one good eye starring down at her. ”Mei” Zuka acknowledged, not making any sudden movements until she absolutely had to but becoming hyper aware of the pouch of water she was wearing at her side. Having a feeling she was going to need that soon, she doubted this was Meis attempt at catching up. ”Heya Boss” the other woman answered with a slight nod. As she spoke to Zuka the men around them started getting antsy and moving around more. Zuka could see them out of the corner of her eye and she knew that whatever this was was going to start soon. Standing up a little more Zuka looked up at Mei, raising a brow ”Is this really necessary?” Zuka knew if she really wanted to Mei could take her on alone. The others were overkill, but maybe that was the point? Zuka breathed in a deep breath. So, it was like that then. ”Of course” it was Triad code, your loyalty was to who you currently served and no one else. For a moment there was nothing. No sound, no movement but in a instant it was over. The men behind her jumped to action and Zuka was ready. From her left Zuka saw a flash of orange and a fist fly toward her and she stepped back slightly, letting the Kais arm move in front of and past her. The fire from his fist flew past her face and Zuka squinted her eyes slightly to protect them from the flame. With the firebenders arm out stretched like it was Zuka grabbed it at the wrist with her right hand, holding it in place while she brought her left elbow up, bringing it down in the crook of his arm, keeping her grip on his wrist as she did. The Kai cried out in pain as his arm snapped. Zuka released his wrist and was about to strike again when she felt a hand grab a fist full of her hair. She cried out in pain as she was pulled back before being released. Zuka stumbled back as the three remaining men closed around her. They didn’t skip a beat as the Triple Threat stomped his foot into the sidewalk as small boulders rose from it and hovered in the air a moment before flying toward her. Thankfully, Zuka had a lot of practice when it came to dodging boulders thanks to all her training with Kenji and she knew she had to act quick. Raising her right hand she flourished it to the side, the water streaming out of the pouch in a thin stream. Zuka held on to the end in her hand and used the water like a whip to strike at the rocks. The water sliced through them with ease and the boulders crumbled or shot off to the sides just missing her. With them out of the way Zuka knelt down and swung the water whip at the earthbenders feet, looping it around his left ankle and giving it a good yank, pulling the feet out from under him. As the Triple Threat went down Zuka released the water around his leg and was getting back to her feet to strike him again but before she had the chance to make another hit she felt a sharp pain. Somewhere to her right one of the nonbenders had charged at her side and knocked her away from his partner and Zuka landed on her stomach a few inches away. The water she had splashing to the ground. Quickly she recovered and pushed herself up but as soon as she did she felt arms close around her from behind, trapping her. Zuka twisted and turned, trying to get her attacker in the direction she wanted. Once she had him good enough Zuka planted her feet on the ground and pushed off hard, hoping she had gauged the direction of the building behind them well enough. The force threw them both back until they collided with something hard and she heard the man behind her moan in pain. He didn’t want to let go however and instead tightened his grip around her, squeezing her ribs. Breathing became difficult which was no good. Zuka used the momentum she had created from the first kick back and leaned forward slightly, kicking off again and once more slamming the guys back into the wall. This time however the fourth man came to his rescue and attempted to grab Zukas legs to prevent her from doing it again. Knowing that if he got ahold of her that way this fight was over Zuka once again pushed back but instead of leaning forward she used the man behind her as leverage and lifted herself up and kicked her foot at the forth mans jaw. The kick was hard enough to take him down with ease and now that he was out of the way she had to get the man behind her to let go. Zuka continued to struggle and try to wiggle her way free but his grip was too strong so she did the only other thing she could and threw her head back, colliding the back of her head with the guys nose. That seemed to work as finally his grip loosened enough that she was able to get herself free as he brought his hands up to try to stop the pain. Throwing her hand out Zuka collected the water she had dropped earlier as it once again formed a thin whip in her hand. Zuka swung the whip at the thug that was still clutching his nose and wrapped the water around his neck and yanked it forward. Pulling him right into her waiting fist. Zuka released the whip as soon as she once again made contact with his nose, the force was enough to send him back into the wall. The thug leaned against the wall for a moment as she saw his eyes gloss over before he slid down to the sidewalk in a heap. Now that he was down Zuka turned back around to see just who was left. The two nonbenders were down. The Kai with the broken arm was off cradling his arm and she didn’t think he was much of a threat anymore. That just left the earthbender and…Mei. Mei had stepped back and let the men attempt their luck but now that they were dwindling her time would be coming soon. The Triple Threat had gotten back to his feet and hand once again summoned boulders but this time there were much more of them. Zuka was injured but she could still fight and she stood ready as soon as the rocks started coming for her. The water sliced through the rocks but there were too many and before she knew it she started taking hits. There was a pain in her left arm as one boulder hit, and then another in her right leg, and then again at her side. If she kept taking hits like this she wouldn’t be able to move but she was literally stuck between a rock and a hard place. Her back was to the building she had used earlier and her exits were slim. Zuka kept swiping at the rocks with her water, doing what she could to deflect them and knowing she had to act soon or else be crushed. Unfortunately for her there was no moon in the sky tonight nor had there been any rain in a few days so what she had in regards to water was it and at the rate she was going that water would be gone sooner rather than later. Having no other options Zuka did the only thing she could think of and waited for the Triple Threat to pull up more boulders. Having her opening Zuka took her water and formed it into a ball in front of her, bringing up her hands and pushing out until her palm was flat against the sphere. Small spikes of ice started flying at the Triple Threat, some slicing past his arms and legs leaving cuts. He reacted how she expected him to and shot another boulder at her but Zuka was ready this time and as it started for her Zuka moved to the left and charged at the Triple Threat, going low and wrapping her arms around his middle as she took him down and landed on top of him. Once they were down Zuka brought up her fist and met it with the side of his head which rolled to the side after. With all four of the men down Zuka slowly got back to her feet and stepped away from the men. Her breathing was heavy and she was in a lot of pain but the fight wasn’t over yet, there was still one more opponent left. Mei stood there with her arms crossed watching but now that the show was over she stepped up and readied herself. Zuka didn’t know how many more hits she could take and given the strength she knew Mei had she would have to make sure to avoid any of those or else it would be lights out. Zuka wanted to say something, if Kenji were here she was sure he would have some kind of snarky remark to make but nothing came. The two women stood there in silence with Zuka’s heavy breathing seeming to be the only sound around them. After standing there for what seemed like hours but she was sure was only a few moments Zuka made her move. Running at her Zuka swung her left fist, hoping to use Mei’s size against her to get the upper hand. Mei moved to block like she had hoped and Zuka ducked under her arm and moved until she was behind her, striking Mei in the middle of her back and then moving again to the front right of her and bringing her foot up toward the side of Mei’s head. The two danced back and forth. Zuka would throw a few hits that Mei would either take or block. Part of her wondered if Mei was just playing with her, amusing her and wanting Zuka to feel like she had a fighting chance out of respect for their previous working relationship. It seemed to be exactly what she was doing. After a few more hits like that Mei decided she had had enough and as Zuka went to throw another hit Mei reached out and grabbed Zuka by the neck, stopping her in her tracks. Zuka wrapped her hands around Mei’s wrist in a attempt pry her hand off but Mei was too strong and she just squeezed harder the more Zuka struggled. She fought back, hitting Mei in any way she could but her strength was gone and as she stood there fighting for air Zuka felt her feet barely scrape the ground as she was pushed backward as Mei led them over to the wall of the closest building. Zukas body moved until her back met resistance with the brick behind her. She struggled to free herself out of fear for what was coming but her efforts were fruitless and her vision began to darken from the lack of oxygen and her muscles started to go limp. Before that could take her however Zukas body was pulled away from the wall only to be slammed back with force. The pain rippled through the back of her head and shoulders as well as on top of her other injuries as her as her body was repeatedly slammed against the wall. Zuka wasn’t sure what was what finally did her in: the lack of oxygen or her head being hit against a brick wall multiple times but the last thing she remembered was seeing a sleek, dark green limo pull up on the street as her vision finally went black. That was the thought she had each time she regained consciousness. Each time she tired to piece together what had happened after she blacked out Zuka could only think in small snippets. She remembered being dragged down some dark hallway toward a door and then...nothing. There was another brief flash of being put in a chair as someone hovered over her and the last thing she remembered after that was her head falling forward as everything once again went black. When she came to for the third time Zuka’s head had finally started to clear and felt less like her brain was splashing around her skull. Zuka let out a soft groan as her mind slowly started to become aware and register the pain her body was in with all the trauma it had been through. Everything hurt and the back of her head felt matted and sticky where she was sure it had opened up while she was being thrown against the wall. She stayed like she was for a few minutes, slowly trying to get her bearings back. It was some time before she deemed herself collected enough and slowly opened her eyes. The room she was in was dimly lit but any kind of light burned and she immediately shut them again. Giving her eyes more a chance to adjust Zuka tried once more, opening them little by little until they could stand the brightness. Everything around her went from blurry to clear and back again as her eyes tried to focus but finally, her vision settled and Zuka noticed for the first time that she was leaning forward and to the right. Her body must have slumped over during her blackout and slowly Zuka tried to pull herself upright. A decision she immediately regretted. The sudden shift, no matter how slow and small caused Zuka’s head to pound in agony and she squinted her eyes shut once more to try to counteract the dizziness she felt as the room started to spin. Her limbs also protested, being bruised like they were and having gone stiff from sitting how she had been for so long…however long that was. There was something else to. As she sat there trying to settle down Zuka felt a wetness around each wrist and a pressure around her ankles and midsection. Gently Zuka tried to flex those muscles and put strain on them but they wouldn’t move and she realized that she was tied to the chair she had been placed in. The ropes must have dug into her wrist from the weight put on them from her body leaning like it had been. Finally, her body relaxed slightly. Nothing was going to make her head feel better, any kind of movement brought a sudden pain and rush of dizziness which she was sure dehydration wasn’t helping any but, she would live. Zuka had a lot of questions. Most important being where was she and who was keeping her here. Now that she was fully aware Zuka went over the brief flashes of what she could remember, hoping something new would shake itself lose or stand out but she must have been pretty out of it because there was nothing useful. with that plan having failed Zuka instead turned her attention to her surroundings, looking around the room she was locked in, looking for any clues she could. The room was bare. The only thing in here besides the chair she was tied to was a thin, dim lightbulb hanging from the ceiling. Judging by the dampness in the air she was sure she was underground somewhere but that didn’t help her either. Maybe if her hands weren’t bound Zuka could pull the moisture from the air and do something with that but in her current state she wouldn’t get very far. She couldn’t remember anything and there was nothing worth noting in the room but there had to be something that could tell her where she was. Closing her eyes she focused her hearing and tried to listen for any kind of noise: the sound of a boats horn, train whistle, clock tower…anything that might give her a hint of her location but there was nothing! Zuka sat there listening for what felt like hours and for all she knew it probably was. She had no sense of time right now and after being so disorientated minutes felt like hours and vice versa. As she sat there Zuka tried moving her wrist, hoping the slickness from the blood would make it easier for her hand to slip itself free but the ropes were tied too tight. She continued to try however, keeping her eyes shut and listening for any kind of sound and finally, something caught her attention. The sound was faint at first but the longer she listened she could hear healed footsteps getting closer. The footsteps had no sense of urgency, they were slow and calm and as they reached the other side of the door and when she heard the locks start to click Zuka opened her eyes and waited for the door to swing open. Zuka had seen a lot of things in her life and she had expected some kind of surprise when that door opened but even she was not prepared for what she saw. Standing in a door was a woman, in all black covering every inch of her body. That wasn’t the shocking part, the womans sense of style was her own business but it was her face that had unnerved her…or should she say lack there of. 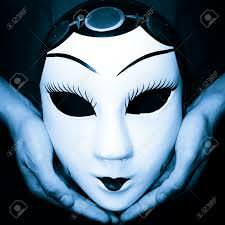 In place of a face Zuka was met with a pale, blank stare of a white mask that seemed to almost float against the black background created by the womans clothes and the dim lighting of the small room. She looked like a spirit. Quietly the woman stood there as a man stepped up behind her and into the room and circled his way behind Zuka. The urge to follow him was strong but Zuka didn’t want to show weakness to this woman by taking her eyes off of her, this was the person that had organized all of this, it had to be and she wasn’t going to give her a inch to run with, not if she could help it. ”Who are you” Zuka’s voice was dry and cracked as she spoke, not being used in days causing it to go hoarse. She doubted she would get that answer so easily but she wanted to know. The woman ignored the question and simply stood there. Zuka could feel the eyes behind the mask burning a hole through her and to be quite honest it was making her uncomfortable and she felt her anxiety begin to rise the longer it went on. ”What do you want?” Zuka weakly asked, figuring she would give that a try since her first question had been ignored. Again, no answer. Instead the woman in black clasped her hands together in front of her body and slightly titled her head. ”How are you feeling? You took quite the beating. ” There was no concern in her voice. ”Peachy” Zuka;s horse voice spoke out, her head was starting to hurt more and she wasn’t sure if it was from the injury or her annoyance. Zuka scoffed. Banter, really? Right now? ”Oh yeah, it’s just like staying at the Rtiz” Zuka felt a smack to the back of her head which made her vision go blurry from the sudden resurgence of pain to her already tender skull. She groaned through gritted teeth and was able to make out the woman hold up her hand in a stop motion to stop the guard behind her from striking again. Seemed he didn’t like the way she was talking to his boss. ”You know.” Zuka started as she slightly shook her head to try to clear it ”if you’re planning on questioning someone you never start with the head, makes things..fuzzy” She had heard Kenji say that once or twice in their time with the mask and right now it felt appropriate. Zuka assumed this woman would want some kind of answers out of her and it didn’t do her any good to give the prisoner more head trauma. A cold, dry chuckle came from behind the mask and the sound nearly sent a shiver up Zukas spine. Zuka’s eyes narrowed slightly at the comment. Part of Zuka thought and hoped this could just be a triad thing, that maybe they had gotten lucky on that end and her ambush had just been part of some triad revenge scheme. Of course, luck was never really something she and Kenji had in spades. ”And what do you want?” Zuka asked since they were winding up to that. Slowly, the woman stepped forward until she was inches from where Zuka was tied in the chair. ”What do I want?” She asked, placing her hands on top of Zukas wrist before leaning down to be level with her. Being so close Zuka could see the dark brown eyes behind the mask flicker with rage. The voice might be calm but whatever was behind the mask was ready to kill. ”’There’s a lot of things that I want but what I want right now is, I want the two of you to pay for what you did. ” The woman lingered like she was for a moment before pushing off Zuka’s wrist which caused her to grimace in pain. The womans answers were vague but she was sure that was on purpose. What Kenji and her did? That could mean a lot of things but didn't want to sit here and argue with this woman. The woman in black stood upright, taking a few steps back. There was confusion across her face, so this was someone she knew? ’You don’t know anything about him” Zuka said with venom which caused the masked woman to laugh once more. Three days? That’s how long she had been here, she could only imagine what the others must be thinking but she hoped they would be smart about looking for her. Kenji was always smart about things, he wouldn’t’ do anything stupid now. ”He will find you” Zuka wasn’t sure what her part in all of this was but if this woman wanted revenge like she said that didn’t leave many options left for her. If something happened to her Zuka knew that Kenji and Zula would find this woman and make her pay. ”Kenji wouldn’t be that stupid he’ll know it’s a trap, if you know him as well as you think then you know that.” he wouldn’t risk all that just to come and get her. Zuka’s eyes narrowed. The idea of her being used to lure Kenji and Zula here put a pit in her stomach, if anything happened to them because of her then she would never forgive herself. She was the one stupid enough to let herself get taken, they shouldn’t have to pay for that mistake. After that there was silence. For a few moments there was nothing but the tension in the room continued to rise and Zuka started to strain herself against her bindings. Their enemy was right here and she could do nothing! Zuka’s fear started to be pushed aside as anger began taking over, she had to fight, had to do something instead of just sit here and let whatever happen, not if the others were in danger too. Seeing the fight slowly start to return to her prisoner the woman in black turned and headed back for the door. Stopping to pause in the doorway and motioning to the other guard outside. The woman turned back to face Zuka and stood there as other man stepped around her and to the back of the room behind Zukas chair with his partner. Zuka’s eyes bounced between the woman and the two men as saw one slip on a Equalist glove and the other pull out a electric baton. Fear started to creep its way back but Zuka tried her best to push it back down. ”You know” the woman spoke and Zukas eyes fixated on her as she began taking in deeper, slower breaths to try to prepare her body for the pain that was going to come ”the next time you try to kill someone….you should make sure they’re dead” The woman let that hang in the air for a moment before giving a nod to the two men. Zuka’s mind began working through what that statement could possibly mean. The only people she and Kenji had tried to kill had been Han, Ula and Jaya and Zuka knew for a fact that Han and Ula were dead. Ula by her own hand. Then that had to mean…. The woman turned and walked out the door as realization hit Zuka. Before she could do anything else with that information however she felt a cold metal hand grab her already injured shoulder. Any kind of preparation she might have had before vanished as soon as she realized just who they had been dealing with so she was not prepared as the glove sparked to life and the shock traveled her body. Zuka was no stranger to the burn and sting of electricity and she gritted her teeth and bit down to try to keep herself from screaming out but that only lasted a few seconds. Not long after the glove came to life she felt the baton being pressed against her left side and her pain doubled. Zuka tried to hold on, wanting to fight through it but her body had no fight left in it and the last thing she saw was the door to the room closing before blackness once again took over. Walking out of the room she closed the door behind her and started back up the dark hallway. Zuka’s screams echoed through the old halls until they stopped all together and a smile creeped past her lips. If she was being honest Zuka wasn’t really of that much interest to her. She had been part of the plan yes and she would pay for that, but Jaya knew the brains behind it all had all been Kenji. He was the one that planned her downfall and he was the one she wanted. Zuka was simply the bait. What remained of the old Triads had more interest in her than she had. Jaya had been so patient waiting for the right moment. Months and months of waiting, months of moving her pieces across a proverbial chessboard had lead to this and Jaya was going to savor it. Reaching the end of the corridor Jaya climbed the stairs to the main warehouse floor. Her base of operations tonight was off the beaten path and nestled in the mountains around Republic City. The old Equalist airfields had been destroyed but most of the foundations from the remaining buildings still stood and the labyrinths of tunnels under the compound proved useful. Jaya had chosen this location for its seclusion. She knew that taking Zuka would cause alarm and that Kenji and the sister would scour the city looking for her and the last thing she wanted was for them to find her prematurely. Once she reached the main level Jaya walked to the office she was using as her own for the night and sat at the desk and poured herself a drink. Removing her mask Jaya laid it next to the glass. The burns across her body still stung even now the mask hurt each time she put it on but it served as a reminder and had a purpose. It was almost ironic that her burn she had received from her tribe that marked her a traitor was all but erased, buried under the new burns she had gotten because of Kenji and Zuka. . Jaya mused on that a bit as she raised the glass to her lips and was about to take a drink when a light knock caught her attention. Setting the glass back down Jaya turned her eyes to the door and saw one of her generals standing there. ”And?” she asked, waiting for a status update. The general nodded and then disappeared to carry out his orders. As he left Jaya walked over to the office window and looked a moment, letting out a calm breath as she watched the mid day sun slowly begin to sink behind the mountains. All of her planning, all of her waiting, of watching their every move for months and weeks…all of her sacrifice was going to be rewarded. Jaya continued to watch the sky turn from blue to a dim pink as she sipped her drink. The pieces were falling into place, the board was set and soon all of the players would arrive. OK so, if you guys do decide to run with this you can either post it here or start your own thread but theres still one small part that would go with it. The ‘package’ that Jaya had sent out would be letters to both Kenji and Zula. Each containing a invitation and something that belong to Zuka. Kenji would be sent the necklace of Zukas grandmothers betrothal charm she wore around her neck and Zula would be sent a ring Zuka always wore. The invites would contain actual invites with something along the lines of ‘lady ou-yong formally request your presence at such and such location” or something like that and each would be delivered at the same time early in the day. One to Kenjis office or home whichever and one to Zulas office at the consulate. Probably also delivered by random people that have no ties to this to keep the mystery up. Ok, I think that’s it. But yeah, had to muse and had to use it lol. It had all started out so good. Kenji had finally purchased his new offices. It was a bit more uptown than his old one and this time was a whole floor instead of just a single office. It was enough room that he could have his office, and also a furnished apartment. It had cost a good amount and he had to sell off a few of his old safehouses to do it, but it had been worth it. Teo had convinced him to head out and celebrate with him, which was partially to celebrate and partially to once again draw him out of the mystery that still consumed his free time. He and Teo had been several drinks deep, when suddenly they had ran into Zula and Neva who looked worried, saying that Zuka had not made it out and that they had checked both clubs and she wasn’t there either. Keni and Teo joined them on the search around the surrounding area around the club. Eventually they found some small signs of struggle, but too small to be the actual struggle. Kenji knew Zuka wouldn’t have gone down so easily, there should have been more of a fight, so someone was covering things up. There was nothing that lead anywhere, no clues. It was as if the earth had opened up and swallowed her whole. For the next three days, they searched the city for her, every place they could think of, they pressed every underworld contact they had, but still nothing. Kenji kept a calm methodical face during the search, but in private he was worried. In Republic City there was always a leak, or a bit of information somewhere. Always some low level thug or minor associate looking for a quick payday. However this time there was nothing,everything was silent. Which meant that whoever had done this had enough sway to quiet the underworld and that was unsettling to Kenji. He was in the midst of thinking that this was some sort of joke, but than something else slipped out of the envelope. The betrothal charm Zuka had worn around her neck, fell into his outstretched hand. Kenji hadn’t even realized that he had pinned the messenger to the wall, his hand cutting off the messengers air supply, until a few minutes later. However in the end it was for naught. The guy was just that a messenger, paid by some guy off the street, who no doubt was just another guy that had been paid to find the messenger, just as series of dead ends. Kenji let the messenger go and retreated into his his adjoining apartment. He sat down in a chair, and than slammed his balled up fist on a nearby table, he than did it again, and again, until he couldn't muster the energy to lift his hand again. He could feel the edge of his knuckles slick with a bit of his own blood. He sat there for what seemed like ages. His office phone rang, but he ignored it as he still just sat there. Finally he began to get his head back on straight and began to get back to some semblance of rational thinking. He knew that eventually who ever had set the wheel in motion would make another move eventually. This was it, with so little known there were only three moves on the table. The first and most obvious. Don’t play the game, ignore the invitation, don’t show up. Kenji couldn’t do that though, he wouldn’t do that. He cared for Zuka too much to do that. Spirits, he more than cared for he at this point. There was a four letter word for how he felt about her, but neither one of them had said that yet, and doing so now seemed rather morbid in his mind. The second choice was to put back on his mask, and suit up. He hadn’t returned to being the Ghost yet, in order to try and space out in order to avoid the comparison to his return and The Ghosts. However he could get the armor and the mask, and suit up, and go the location on the invitation and see how many bodies he had to drop to get Zuka back. That was the option he wanted, the one he wanted to do that right now, no waiting just go. However….. The one thing he did know about their unknown adversary was that while whoever they were knew the secret behind the mask, their underlings did not. However if a package for recently resurrected private investigator ended up producing a masked vigilante than it was a good as signing his name on the mask. It would give away one of the few precious advantages that they had. Which left the final option. Go to the location as himself. No armor, no mask,and no weapons than the few that he might be able to sneak by, if he was lucky, which given what was happening, that was unlikely. He would be walking into the Lizard Lions den, unarmed, but it was the only true move he had. Didn’t make it any better or easier. If there was one thing he hated above all else it was feeling like someone else pawn. But that’s what he was, for now, so better adjust. First things first, he went back to his bedroom and shoved the bed to the side then pulled aside a few loose floorboards, which underneath there was a hidden safe. He spun the dials and unlocked it than pulled out three envelopes. He then put the floorboards back and shifted his bed back into place. He then fished a couple of metal coils and a pouch of sand. He then moved his other hand and the bag of sand left on to his arm and flattened, the coils wrapping around it to secure it in place. It dug into his arm painfully, but it was so flat against his arm that most would miss it during a pat down and that’s what he was hoping. He then got dressed, well redressed. If this was going to be his funeral than might as well look good for it. He put on shined black shoes, a black shirt, and a crisp black suit. He then got a dark emerald green tie and tied it around his neck. He looked in the mirror and sighed for a minute and then tucked away the envelopes into his inside jacket pocket and then tossed a couple of coins in the other pocket. He grabbed his hat on the way out the door and he was off. A sharp suit, some coins, coils, and a bag of sand, that's all he had. It wasn’t much but at this point it was what little hope he had. He assumed that he’d be watched, even if he couldn’t see them. He made a beeline to Teo’s shop, picking up another loaner car, seeing as Teo was once again “tinkering” with his sleek black satomobile. He waited until none of the other mechanics were watching then placed the first envelope by his toolbox. He’d know the drill when he found it, to wait a couple of days and if he hadn't heard anything to take that envelope and leave. Now driving,the second place he went was the Blue Dragon where he had a well earned drink. He made a point of serving himself, which nobody minded because he was regular fixture around here. While he was reaching for the liquor he slipped another envelope in a small alcove of the bar. Only someone looking for it would know it was there, and when Neva heard that he had been there, she’d know to look for it. The last stop was one he didn’t want to make, but he had to. So he made his way toward the Fire Nation consulate. Once he was there he got out and made his way to Zula’s office. He talked his way past any security and than outright ignored the assistant that yelled at him that she wasn’t seeing anyone and instead went inside and then locked the door behind him. He then pulled the third envelope out of his pocket and tossed it on her desk. He then leaned back in his chair and said “ I’ll wait for your decision.” and then fell silent letting her speak. Zuka had warned her how dangerous this life was, and now Zula saw what she meant. It was supposed to be a night out on the town, and Zula had been looking forward to it more than she let on. Most of the time she spent with Zuka lately had been when they trained together, and while it was nice to train with her sister she wanted to spend some time with her without throwing punches her way. She imagined that the night would end with her going home with a smile on her face and more relaxed than she’d been in a while. Instead, it ended with Zuka missing and many more questions than answers. Kenji kept a calm face during the search in the days after, and Neva did her best to assure her that everything would be fine. Zula didn’t believe any of it for a second. There was a pit in her stomach, this feeling that she couldn’t explain outright, that told her that something terrible had happened to Zuka. She assumed it was part of their twin bond--knowing when the other wasn’t alright even if they didn’t know what was wrong. Unlike everyone else, Zula was visibly agitated. The longer they went without answers, the more restless she became. At night, The Cinder took the streets to attempt to discover something new, but to no avail. If she had it her way, she would have dropped everything, made up as many excuses as possible to push aside her other responsibilities to search around the clock. It was only Kenji’s own warning that stopped her: that if she did so, she’d draw more attention to herself and only look more suspicious. She didn’t want to listen to that, but she knew that it was for the best. Besides, Zula had stretched all her own resources thin, and that had come up with nothing. There wasn’t anyone else she could ask and nowhere else she could think to search. She couldn’t stand being so empty handed, but it wasn’t as though any other paths were open for her to take. That was how she found herself at the consulate, sitting in a meeting that she knew she couldn’t afford to miss. As the ambassador for the Earth Kingdom spoke Zula fought to listen. It wasn’t that she didn’t care, she truly did, but her mind wandered every minute. Even as she concentrated fully on what he was saying, the words seemed to go in one ear and out the other. Zula resisted tapping her fingers against the table, attempting to orient her focus to the task at hand. It wasn’t a long meeting, a couple hours at best that she had to dedicate her time. She’d prepared what she had to say beforehand, and even though she hadn’t been listening all that closely, the Earth Kingdom’s way of dealing with issues was predictable enough that she could manage presenting the Fire Nation’s case without revealing just how much she’d missed. Whether or not the others in the room took her as serious as usual was up for debate, and Zula knew that her presentation wasn’t up to her usual standards. At least she wasn’t trying to sway anyone’s opinion today, because she would have easily lost that battle. When the meeting finally ended Zula did her best to not hurry out of the room. That hadn’t gone at all how she’d hoped, and while Zula usually didn’t mind being in the spotlight,she wanted to be as far out of it as possible right now. She made her way towards her office, ignoring any of the mumbling of the other officials around her, deciding to deal with them and the outcome of her head-in-the-clouds moment later. An invitation? Zula frowned in confusion and went to set the envelope down when her fingers brushed over a round shape inside of it. She set the invitation down on her desk and reached inside again and pulled the object out: a ring. At the sight of it Zula felt as though she’d just had the wind knocked out of her. Zuka had worn it enough that Zula instantly recognized the jewelry, and it caused a rush of adrenaline to go through her. Zula strode back to her office, closing the doors behind her tightly. She immediately went to the phone and dialed, waiting for the call to be picked up. Instead, she was met with silence. Zula looked at the phone, half tempted to call back. But if Kenji hadn’t picked up the first time, she doubted he would the second time. There was a possibility he wasn’t even there, and that would be no help to her. She sighed, half out of frustration, and set the phone back on the receiver harder than necessary. The next moment she found herself pacing her office, going across the room, to the window, and back again over and over. Her thoughts spun in every direction; one was her deep worry for Zuka, the next was a streak of pure anger towards whoever had taken her. It was a back and forth war until she’d gone over them enough that she could finally switch to the new phase of thoughts: what was she going to do? Zula stopped her pacing, took a deep breath. She had to consider this heavily. Obviously she was going to do something. Ignoring the invitation was out of the question. Her sister’s life could very well be on the line and she wasn’t going to abandon her like that. But Zula didn’t have the slightest clue what she was in for if she went. She didn’t know who was waiting, how many people might be there to try and stop her, or what they were capable of doing. The unknowns were heavily stacked against her. She had The Cinder, sure, but she didn’t know what good it would do, if any. She’d learned to be careful about her mask, but did it even matter? What if these people already knew the two were connected? They had to know something if they’d bothered to send her this. So whether she showed up in uniform or as herself, it may not even matter if she hadn’t the slightest inkling as to what she was walking into. Zula sighed, sitting down at her desk and putting her head in her hands. She needed to take action, but figuring out these complex plans had never been her strong suit. No, what she had dealt with so far didn’t even compare a fraction to something as big as this problem. After a little while she lifted her head and sat forwards, turning the ring over and over in her hands as she thought. Suddenly she heard commotion outside and raised her head, her eyebrows furrowing in confusion as she recognized her assistant yelling. Zula was about to get to her feet when the doors swung open and Kenji entered, locking the doors behind him. Well, that made sense rather quickly. She almost asked him where he’d been, but she saw the look on his face as his eyes fell to the invitation her desk and she opted to stay quiet instead. She listened to him explain, resisting to show the surprise on her face. This wasn’t the conversation she was expecting, but there was something different about this situation. The two of them had always stood on rocky ground, to say the least. But when it came to Zuka, they’d managed to put aside their differences for her sake. This was one of those times, and Zula knew that Zuka had been right: he’d grown on her. As much as it took her to admit that, she was not so opposed to him anymore as she had been in the beginning--even if he still frustrated her to no end at times. As the envelope hit her desk she raised an eyebrow and looked back to him, not moving to open this one. It took everything in her not to outright decline the envelope the moment he explained what was inside. Leave? Was he insane? But Zula forced herself to listen, to be patient, and give him the opportunity to finish. Her hand tightened around the ring, but other than that she stayed silent. Not that long ago she would have dismissed his words entirely, thinking that she knew everything, but Zula knew better than that now. She waited for him to finish and then stared down at the new envelope, contemplating. The threat was real, on every level. She realized that she could walk in there and never come back out--that none of them might leave this place alive. It was a risk she’d thought about before but never really had to fully face until now. It made sense to her why Zuka had done everything short of begging to convince Zula to go back to the life she’d known and stay out of the underground. But it was far too late for that. Zula was in, and she’d been in for some time. Knowing that Zuka was in trouble was enough of a motivator to seal her fate. Well he had tried to get her to bow out, but despite their insistence that they were not alike, the Ou-Yong sisters were equally stubborn. When she said she wanted in, Kenji didn't bother trying convince her otherwise or argue, he just moved past it. He hadn't really expected her to go anyway,but he had to a least offer. So he took a deep breath and said " Okay let's start with with basics and go from there." Brief time skip...to get us to the meat of things if no one minds…. It was a quick stop for Zula to change clothes and get whatever weapons she could. Then they were on the road again. Following the instructions left on the card, they started to head form paved roads to back roads, into the mountains surrounding the city. Time passed as the sun went down and the city lights went up in the background as they neared the location. Looked like and old Equalist hideout, half in ruins, and half still standing, but plenty of places to hide. Every part of Kenji’s brain was screaming that this was trap, but he steeled himself. He entered into the seemingly abandoned area and drove toward the structure that looked the most intact and parked just a few yards away from it. He shut off the car, but left the keys inside, just in case things went well and they needed a fast getaway. Than stepped out of the car walking out and scanning the area. She listened intently, nodding here and there as he explained. As much as not wearing a mask would normally irk her, right now it didn’t matter. In the beginning she’d despised doing anything without the Cinder, but she’d grown at least a little more used to the idea of occasionally operating without it. Besides, like Kenji had said, it wasn’t worth giving the grunts their identities to run with. The more they had on their side, the better. It was also beneficial that she’d been working with him long enough that what she’d normally take as insults passed over her with just a flicker of annoyance. Thankfully she’d grown used to the way he explained about plans and her own personality, or this would be a lot harder than it needed to be on her end. Zula didn’t argue with him--she didn’t have the will to do so. She took his orders and nodded, merely shooting him a slight look when he mentioned her instincts. At his fifth order to leave him behind if necessary, Zula pressed her lips together momentarily. Now that she didn’t want to do, but she had to remind herself that he knew better. This wasn’t some exercise that he crafted himself to test her skills, all planned out with contingencies in case she fell flat. Really, they’d never had to trust each other before, not in a way that their lives depended on it. Zula knew he was right: it was time to act, not worry about details. If there was ever a time when she’d truly have to ditch planning and act on her feet, this was it. The best they could do with the little that they had, at least. Zula rose from her desk, following Kenji out the doors and ignoring her assistant’s bafflement as she went. If there was a need for an explanation, she’d come up with one later. All that mattered right now was getting to her sister. She went out to the Satomobile and stepped into the passenger side, already so deep in thought that she almost didn’t notice Kenji had paused, until she turned to him when she realized he hadn’t started the vehicle. The beginning and the end. Well, if that was the case, they had their own plan to put into play. She just hoped that their weakness wouldn’t be enough to make them crack. Zula alternated between staring down at the card to looking out the window on the way there. Now dressed in simple clothes that allowed her ease of movement, she was also very aware of the knives she’d managed to stash within the folds and few layers that she wore. Some she suspected might be taken, but as long as there wasn’t an expert searching her person, she had confidence that most hidden within the folds wouldn’t be caught. Usually Zula was brimming with questions, but this time she found her mind strangely quiet other than the anxiousness for Zuka. The closer they drew, the more isolated they became from the city. This wasn’t looking good for them, but she kept her mind focused on their goal: get Zuka and get out. She knew they were doing exactly what their enemy wanted of them, but it was their only option. Zula never liked giving in, but this wasn’t an instance they could fight without first giving the opposite side what they wanted. As they pulled in Zula took a deep breath, bracing herself for what they were about to get themselves into. There was no turning back now, but turning back had never once been a thought in her mind. She waited for Kenji to step out and then did the same, moving away from the car as she took in the area around them. It looked about as shady as a secret hideout could get--though the whole situation wasn’t exactly a very clean operation. As Kenji called out Zula looked around, waiting for someone to lurk out and approach them. It may have seemed like they were alone, but she knew that definitely wasn’t the case. A voice said over the two way radio as one of her guards on the grounds spotted a car coming through the mountains in the distance. Kanan nodded and brought the speaker closer to his mouth ”be ready to intercept. Stick to the plan” with the final orders given Jaya took in a deep breath and rolled her shoulders back. This was it, her game was finally going to start with all the players present. From her location hidden inside the main hanger Jaya saw headlights pull into the area and heard car doors close as Kenji and Zula stepped out. A small chuckle came from Jaya as she watched the two, even from this distance she could see how tense they were but Kenji still had to put on his act. She would give them credit, walking blindly into a trap took a iron will and while Jaya was certain the two had worked out some sort of plan on their ride here there was no way they could be prepared for everything. As Kenji and Zula stepped around to the front of the car two men came out of the shadows from the sides of the hanger and told them to remain where they were so they could be searched. The Black Hand members patted down each other them, pulling a few of Zulas knives from their hiding spot but once they were satisfied with the search the Black Hand members gave Kenji and Zula a small shove toward the hanger and told them to move. Jaya waited for her guest to enter the hanger and get close enough before she started ”I was starting to wonder if you were going to ignore my invitation” Jaya spoke, stepping from the darkness at the back of the hanger and moving toward the dim light in the center. As The Shadow moved her generals moved with her, flanking her on either side ”she told me you would, that you wouldn’t risk your lives but here you are.” Jayas jaw clenched underneath her mask. It was so hard not to attack him now, despite all of her planning and dreaming about how she would end him Jaya just wanted to attack him and be done with it but…she wouldn’t do that. Too much planning had gone into this thus far and the satisfaction would be worth it in the end if she just stuck to the plan. It didn't take long before some things emerged form the shadows. Kenji lifted up his hands to show he was unarmed and they did a pat down. Kenji noticed they found some knifes on Zula, though he hoped she still had more somewhere. As for him they found nothing, which Kenji had hoped for. After all, with a couple of male thugs doing the searching he figured they would probably give him only a once over, and search Zula a bit more thoroughly. It was a low risk gamble, but the the only one that he would be taking tonight. All the others were a much higher risk. They were shoved into the hanger, and then more emerged from the shadows. Those that did looked ready for a brawl, and in the center of them was a woman, dressed in black, with a pale mask over her face. Kenji gave a potentially charming smile as he then said" Well you have someone of ours, so we figured it would be bad form to leave her stranded, so we figured we'd pick her up, so if you'd be so kind to as to bring her out, we'll be on our way..."
"So that's a no?" Kenji shrugged " Ah well, worth a shot. I'm sorry I'm sort of improvising here, after all you all have me at a disadvantage." The smile disappeared from his face as he then said flatly " Then again I suspect that was the point." Zula resisted squirming as they patted her down, very well aware of where all of her knives were hidden. She knew she had to cooperate, even when she wanted to react as they searched her. Holding it together, she focused on the knives that were found on her. To her relief, they didn't take all of them; she still had some hidden on her person and in reach. As the men shoved them forwards she glared over her shoulder, but kept silent and walked into the hangar. She didn't know what she was expecting, but it was not this. Zula's eyes widened as the masked woman stepped into view, the white mask startling against her black ensemble. Zula had grown used to masks she thought, especially since she wore one, but this one was different. Her eyes quickly narrowed, her shoulders back and body tense. The fact that she didn't really have any information to aide her at this point frustrated her. What was this, some sick game? She remembered Zuka saying that her and Kenji had made quite a few enemies, but Zula couldn't imagine what would prompt something like this. It wasn't an attack as much as it was a show--at least for the moment. She kept her narrowed gaze on the woman, listening to Kenji, and then threw out her own question. "You have us where you want. But why go to all the trouble for this?" The request for Zuka back made Jaya smile under her mask. She was glad that all of his time away had not changed who he was, Kenji still had to play like he was unbothered by things. Had to maintain that strong presence while he tried to work things out in his mind. It was what made him so good and why Jaya wanted to play her game. It would be easy to kill him now, Kenji had to know that coming here would be a death sentence. Even if Jaya had some of her people here it was nothing compared to what she could have had waiting. Jaya could have brought the full force of the Black Hand down on the three of them tonight and be done with it but that wouldn’t give her the satisfaction she wanted. Of course Jaya wanted them dead but she wanted more than just that. Jaya wanted Kenji broken, defeated and with nothing left and that would take time. Time she was willing to give. Kenji and the others would fight back of course, she didn’t expect them to go down quietly or quickly and that was part of the fun. Jaya wanted the challenge, to know that she had beat Kenji at his own game. Only then could she be satisfied with his death. For a moment Jaya stood there in silence a silence that Zula used to ask her own questions. Jaya paused mid sentence and glanced to her left where Oku and Kanan were standing, giving a slight nod. Kanan nodded back and turned back, motioning to someone behind them. Slowly a figure started to come into view as one of the guards from the earlier interrogation walked from behind Jaya and the others, dragging something with him. Zuka: beaten and unconscious with her hands bound behind her back to prevent any ‘bending accidents’ should she accidently wake. Jaya was sure seeing their friend would cause some type of reaction but she didn’t want them to get off track so soon, there was still a piece of the puzzle she had to reveal ”I didn’t think I would get that chance so soon” Jaya slightly flicked her fingers and a small piece of metal came from the inside of her sleeve to her palm. Jaya held the object in her hand for a moment, her gloved hand squeezing until she could feel the points press through the glove and into her skin. ”Not after how we left things last time” she said, her voice going cold at the memory of the explosion. Jaya could feel the anger start to swell and she pushed it back down, there would be a time for that but right now was not it. As she finished her statement Jaya flicked her hand outward, letting go of the object and using her bending to help send it across the room. The small object landed just short of where Kenji was standing and slid the rest of the way. Laying at his feet was the small lotus sculpture he had given her years ago, the one she had used to draw him back to her. What had been the cause of all this pain and what would continue to serve as a reminder of everything between them. If he hadn’t figured it out before he would know now. Funny how such a small object could set such events in motion and cause so much trouble. Kenji listened to the masked woman talk and then he saw two more goons pop out and throw Zuka down. She was beaten, bruised and unconscious. It took a considerable amount of willpower to keep a straight face when this happened, though he remembered that he wasn’t the only one here. His arm shot out quickly blocking Zula from moving, hoping that just the simple reminder would keep her focused at least for now. The masked woman continued speaking when suddenly sem flung something at him, he readied himself , until he saw it land at his feet and slide toward him. He looked down and that's when he saw the small lotus sculpture at his feet, he recognized it instantly, how could he not? And with that the piece he was missing came tumbling down into place. What happened next was something that rarely happened to Kenji, but for a minute his mind went completely blank. He knew that in reality it was only seconds passing but for him it felt like hours until finally he could hear his own voice ricocheting in his head. It’s impossible, the voice in his head responded. Worry about that later! Focus on the now! More importantly before you had one advantage, now you have two more, and the most important one of those is the fact that the enemy isn’t unknown anymore. Kenji realized that this all of this was to draw him in. The other two weren’t important to Jaya. To her Zuka was just bait and Zula was an anchor, something she hoped would split his focus at a critical moment. Other than that all of this, even the other Triad members around him was just part of performance, with one intended audience: him. But if it worked, well that would be special indeed. Of course the first part of the plan required him to steer right into the skid. He knew that the smart plan was to keep his cool, play defensively, wait for an opening. However, Jaya had done all of this to throw him off balance, to throw him off his game, to make him do the wrong things. So he’d give her exactly what she wanted. Zula watched as there was some movement in the line, listening to the woman speak. Once she saw Zuka tossed onto the floor in front of them, however, Zula quit listening altogether. She couldn’t stop her eyes from widening, taken aback completely by the sight of her sister, beaten and bloodied in front of her. That shock quickly transformed into fury, flashing across her expression. Until this moment, Zula never actually had the desire to kill anyone. Now she was certain this rage burning inside her called for just that. Before she could even think about moving an inch, Kenji’s arm shot out, forcing her to stay back. Her eyes flickered to him, and though everything in her wanted to run forwards, he snapped her from her clouded emotional thought. If she let her emotions make the decisions, she’d ruin everything. Zula restrained herself and the murderous thoughts that were swirling in her head and remained in place, her hands curling into tight fists at her sides. As Kenji said the name, Zula looked back towards the woman, her eyes narrowed. How the two knew each other and were connected Zula didn’t know, but that didn’t matter right now. She’d worry about that later. What she wanted to know was what that meant for them, and if that suddenly made their situation even worse. No one was going to give her that answer, but she looked between the two and waited for something. His tone nearly made her jump it was so unexpected. It took great restraint to keep her surprise from showing on her face, but she kept her expression set as she watched him move towards Jaya and her line. All the while Zula’s mind turned over what had just happened, and while she kept the confusion off her face, it circulated in her head as she tried to figure out just what he was doing. She’d never been able to get a clear read on Kenji. It was safe to say she didn’t know him too well, either. But Zula had been training with him for some time, and even when he had to be beyond frustrated with her, he never sounded like that. She supposed it could be different this time—Zuka on the ground in front of him was good reason to act this way. It was the fact that she’d never seen him lose his cool, not once, that made her look beyond that possibility. She’d watched him put on many masks, each to suit the occasion. This had to be one of them. She didn’t know what he was up to, but Zula stayed put, watching him carefully. She trusted that he was not so caught up in his own feelings to recklessly walk towards the enemy, especially after keeping her in place. He had something up his sleeve, and while she didn’t know what that could possibly be, she knew to play along. She looked between him and Jaya, waiting for her answer to his question. Jaya’s eyes focused in on the sister as Kenji’s arm shot out to keep her in place now that Zuka had been brought out. Having Zuka here would have been enough but having both of the sisters here was a added bonus. Kenji may have been cool, calm and collected but from what she and her spies had observed from Zula is that she was less so. The ambassador might be calm under pressure, but she was not used to this life like the other two were. The pressures of life and death were far different than those in politics and the reality of seeing her sister was sure to get a reaction. At least, that was what Jaya had hoped. Having Kenji preemptively block Zula from making a move was promising and Jaya was sure if they pushed the right buttons she would make a slip up. It was just a matter of finding them. The mask turned to focus back on Kenji after he had said her name. He had finally figured it out. Jaya wondered if there was a part of Kenji that was relieved to know the name of his enemy or if knowing made things worse for him. If she had to guess? Probably a bit of both. Knowing who he was dealing with might give him a false sense that he could get the upper hand in this like he had done in the past and while that may happen here or there in the end, Jaya knew she would win. A lot of things had changed and being as adaptable as she is she changed along with them. Now that the revel had been made Jaya brought her hands up and grasped either side of her ceramic mask and pulled it away. The face underneath was not one that Kenji had been used to, while Jaya still might have some of her beauty it was tarnished by the burns that crawled up the left side of her neck and face. With the mask no longer necessary Jaya handed it off to Ajala who took the mask and held it down at her side. ”Kenji” Jaya answered back. Jaya could see the wheels turning in Kenjis head as he tried to process everything and when he turned back to Zula and started to step forward Jaya rose a brow slightly. Her generals on either side of her began to tense and started to move, ready to attack should Kenji try something and Jaya held up her hand to signal them to stand down. Jaya knew she was well protected, that if Kenji made any kind of move against her that he would be swiftly dealt with and she was sure he knew that. The way he sounded when he spoke told her that she had gotten to him but Jaya was still not convinced, not fully but, perhaps he would surprise her. Jaya lifted her left hand and closed her fist before pulling her hand back. The metal around Zuka’s wrist reacted as her body began to slide back towards Jaya and her generals. Jaya was not gentle in her movements and she dragged Zuka back and forth across the floor. Jaya moved again in a more complicated manner and Zukas body lifted by the wrist until she was hanging limply in the air to the point of almost standing. Jaya fought back a grimace of pain as her nerves all fired to life at once but it was worth it. "I could gloat and tell you about all my accomplishments, let you in on my grand scheme before I kill you all"
Kenji listened to her vollley back still all par for the course for this performance of hers. Then as Jaya pulled Zuka's chains and lifted her up off the ground, Kenji focus was sharpened, but he wasn't watching Zuka. He was watching Jaya, she was trying to to hide it and to her credit she hid it well, but he tell the stiffness in her movements, the directness of it. Seems that their last encounter had left more of a mark than she let on. That gave him a bit more confidence, but there were still so many variables, and that roulette wheel was still spinning. He kept a straight face while she toyed with Zula, it wasn't easy to do, but he had once let himself be beat on by a bunch of Triad bosses to give Zuka enough time to get into position, so he could ignore his impulses, however he knew that Zula was a different story. "FUN?" he said just a bit too loudly, it echoed throughout the garage, as Kenji could feel the eyes on him. He paused and shook his head as if he had just made a mistake and then clasped his hands behind his back, as if he had to hold himself back and took a breath and said at a more calm level " Fun? Jaya I dont know what you think this is but it's not fun, it's not a...." he paused and let the word die in his throat as his eyes darted back and forth from her to Zuka to those around her and back again. ...and while he did that, he unclenched his hand and let the metal lotus go, but it didn't hit the ground, instead with a twitch of his fingers he caused it to sail soundlessly across the room to Zula's feet, although it was no longer a lotus by the time it reached her. It was flat, so it would not stand out on the floor.. and it was in the shape of a wheel. He could only hope that she took the hint and started making moves, becuase what Kenji was about to do was going to be painful enough, if it was for nothing, then it was going to painful and fatal. However he had already gone this far, and there was only one way this was going to continue, he had to keep her focus on him and to do that, he had to give her what she wanted. So he took another couple steps forward, keeping his hands clasped behind him. He could feel other tense once again, but he didn't hesitate as he took another couple steps. Now there was only a few feet separating him from the opposition. He looked at Jaya directly and said " Jaya, I" he then paused and then suddenly sighed and said " just....just let her go." His shoulders sagged in defeat as he said " We could go through the motions, the threats and the games but I'm tired, I'm just tired of this. Just let her and her sister go and I'll surrender to you willingly. you can do what you want with me, torture me, make an example of me, kill me. I won't fight it, just spare them, give them time to leave the city and it'll be yours." It was desperate, bargaining, and it was about to get more pathetic as Kenji then collapsed to his knees as he couldn't hold thee weight under them anymore and for the first time it all that left his voice soften and crack with emotion so the goons and Jaya would have to lean in to hear him " I'm done running Jaya, so just let them go, for old times sake?" he held out on of his hands in a begging gesture "Please?" He had no power here and he had just made it a point to show that. She could let them go now, kill him and then hunt them down later. She could gloat over him and then kill them all. She could even honor the deal he offered if her desire to kill make him suffer was that strong. She held all the cards now. Which was the entire point, she needed to be winning, or else she and those around her might be paying attention to thier surrounding. But they weren't becuase now everyone's eyes were on him and Jaya, waiting for her to speak, to act, to do whatever cruel thing she had in mind. No one was watching Zula though, for the next minute or two, she was free to move as she needed. What happened next all came down to her. Kenji had no doubt in his mind that in all the ways Jaya saw this going in her head, she didn't expect him to rely on a untested person, Zula was a liability not the linchpin to the plan. Which is why he was sure she wouldn't see it coming...if Zula could pull it off. In his mind kenji could hear the clicks of that roulette wheel coming slowly to a stop..... time to see how lucky he really was.